This year is a leap year! 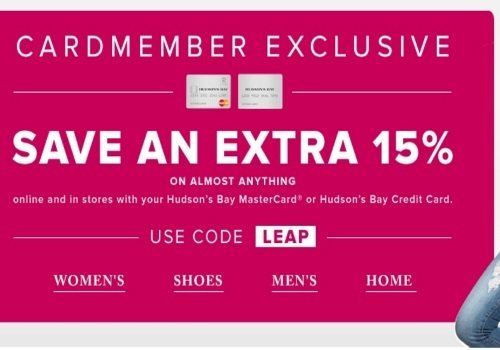 Hudson's Bay is offering an extra 15% off almost anything for their cardholders this weekend! This applies online and in-store when you pay using your Hudson's Bay Mastercard or Credit Card. Enter the promo code LEAP at checkout to get the discount. Offer valid until Sunday, February 28, 2016.